Our lattice patio covers create a grand, simple, and classic design that provides just the right amount of cover from the Arizona sun. 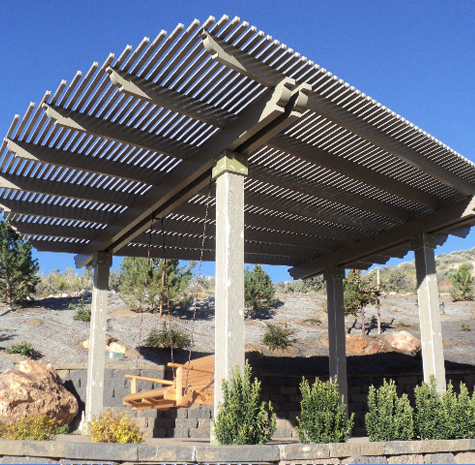 These custom covers use beams and rafters to define the overall design and impact of the shade structure, and the unique construction allows you to determine just the right amount of shade cover you desire. From the cane ramadas of the Native Americans to the courtyards and verandas of the Spanish haciendas, creating a cool, shaded environment has always been the essence of making home a place of comfort and relaxation. Patio shades give you the form and function you need, along with the elegance you desire. 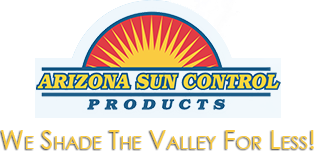 Arizona Sun Control Products uses Alumawood™ products. These products are locally engineered and crafted using durable aluminum that is embossed with a lasting wood texture finish. The covers are virtually maintenance free, so you never have to paint them and there's no cracking, splinters, or insect damage. As a result, your patio cover will be beautiful from the moment it is installed and remain that way for years to come. Alumawood is made using Teflon®-infused coating to protect from UV damage. The coating also repels dirt, dust, oil, and stains, making our lattice patio covers very easy to clean and maintain. The unique combination of aluminum construction and Teflon® coating makes our Alumawood covers an affordable option for patio remodeling. They're also extremely durable and can be custom designed to meet your unique needs. Contact us for a free consultation today, and we'll bring the showroom to your living room!